Welcome to the fifth edition of PuzzleNation App Reviews! Today we continue our quest to explore the world of puzzly games and apps for your tablet or smartphone! Our resident App player and puzzle fiend Sherri has another intriguing game for us today, so without further ado, let’s dive into her review of Spy Mouse for iPad, iPhone, and Android devices! 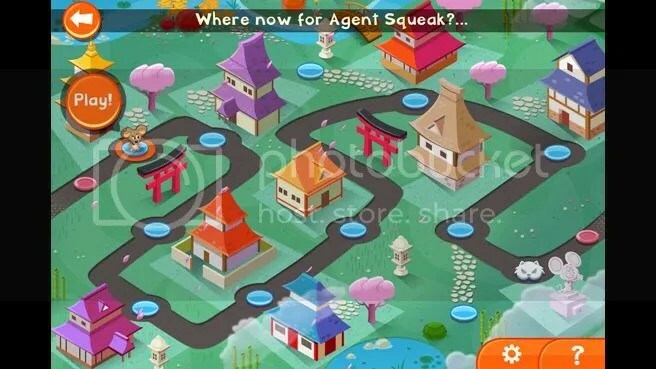 Spy Mouse is an action-packed strategy game for iOS that is great for the logical mind. This is a great game. I am a huge James Bond fan, so playing as a mouse spy was right up my ally. The game is divided into several worlds, and each world is divided into 12 levels, one of which is a secret level. In order to open up later worlds, you need to collect a certain number of blue ribbons. Each level consists of a building in which you must gather all of the cheese while eluding cats that don’t want you to escape. To earn the three ribbons per level, you really need to think logically. You have to plot just the right path around the cats to get the cheese and attain those coveted ribbons. Luckily, you don’t have to earn all those ribbons in one shot, as earning some of those ribbons can be quite tricky! You need patience, and you need to think very strategically. All of that cheese is gathered for a very good reason. You can buy power-ups with your earned cheese that will help you in your quest to earn those ribbons and get more cheese! 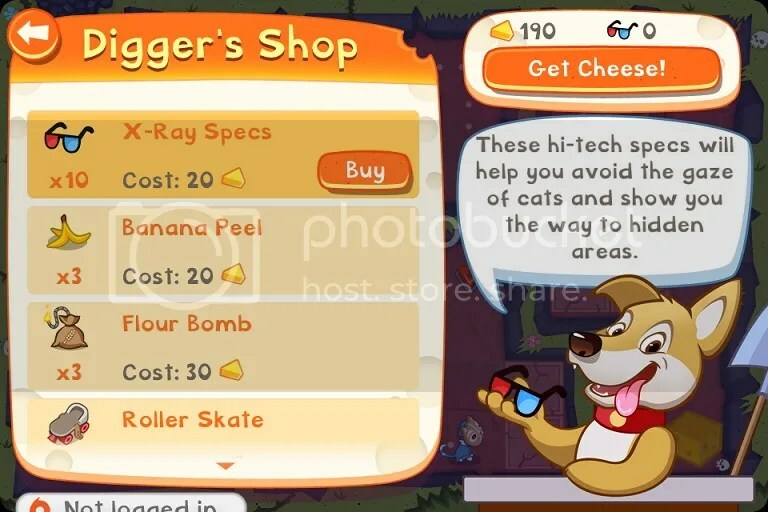 You buy the power-ups from Digger the Dog, who is quite the salesdog. This game also has one element that sets it apart from many other strategic level games. Each world ends with a boss battle! These boss battles touched the RPG bone in me, and I quite enjoyed playing them. Spy Mouse has so much to offer to the puzzle game lover. You have hidden areas to explore in each level and dossiers to collect. If you connect to Facebook, you have a secret level to open in each world, too. There are many achievements to earn and just a lot of fun to be had, so go get your secret agent on and go be a spy! Enjoyability: 4/5 — This is a very cute game. I enjoyed playing Agent Squeak and outsmarting the cats. How well puzzles are incorporated: 4/5 — This game requires a lot of strategy. In order to earn all of the blue ribbons, you need to logically plot your route around the cats. Graphics: 4/5 — The graphics are great. Agent Squeak is adorable, and the cats are suitably menacing, but still cute. The rooms are rendered beautifully, if a bit simply. This is not a flat game. Gameplay: 4/5 — There are three different ribbons to earn for each level, and there are several worlds to play. This is a game that will keep you on your toes for quite a while. 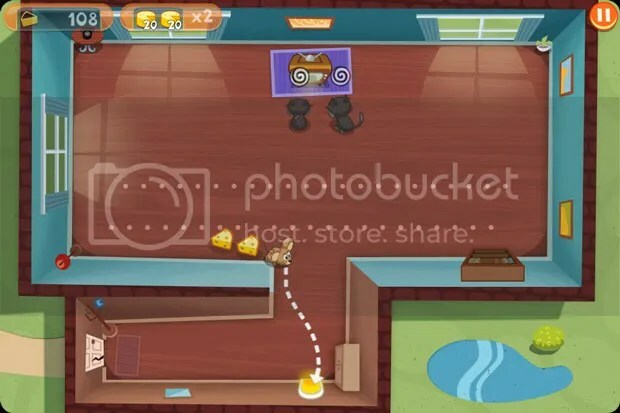 This entry was posted in Games, PuzzleNation, Puzzles and tagged Agent Squeak, android, app review, boss battle, Digger the Dog, games, Geeking Out, IOS, iPad, Pop culture, product review, PuzzleNation, Puzzlin' fool, rpg, Sherri, Spy Mouse, strategy by gmdirect. Bookmark the permalink.